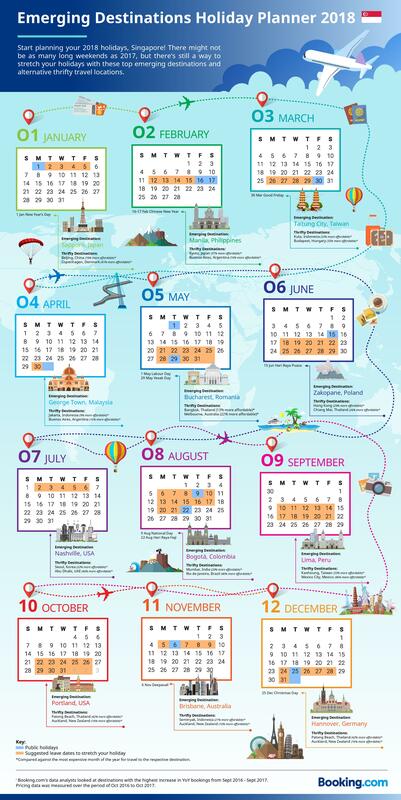 What a better way to kickstart your holiday planning with Booking.com's exclusive Holiday Planner 2018. Discover the top emerging destinations of 2018 and the best ways to maximise annual leave around the public holiday calendar! 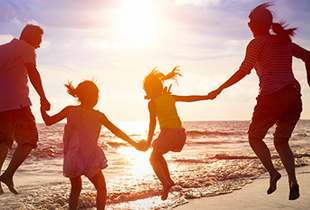 As an added bonus, Booking.com has provided alternative thrifty travel locations for each month of the year, to help travellers of all budgets to find the best value-for-money destination. Why not kick off of the year with a bit of snow? Many travellers visit Japan for the bustling nightlife of Tokyo or temples of Kyoto, but how about traversing the hidden gem of which is the dynamic city of Sapporo? This city is a great base for exploring the mountains and hot springs of Hokkaido and offers great restaurants, being known best for its variety of seafood. Sapporo also has a thriving food scene - top traveller's picks are seafood and gourmet food. Where to stay: Japanese style inns or ryokans are a great place to stay to truly experience Japanese culture. Booking.com recommends Guest House Yuyu, a homely stay which offers bike hire so you can easily explore the city. An emerging destination for Singaporeans in particular, Manila is known for shopping, food and friendly locals. This heaving metropolis is filled with numerous mega-malls and a flourishing foodie scene to indulge in local staples such as Adobo and Lechon, amid skyscrapers and cultural centres. It’s also an opportunity to enjoy the Chinese New Year festivities in the oldest and largest Chinatown in the world - Binondo, having been established in 1594. Where to stay: The Henry Hotel Manila offers respite from the hustle and bustle of the city, situated in a private compound with lush greenery. A free shuttle service is provided to SM Mall of Asia and Glorietta Mall. You may not have heard much about Taitung City, the relaxed coastal town of Taiwan, but with its modest charm, cultural diversity and mix of mountains, hot springs, temples and ocean activities, it's fast becoming a popular choice of destination. Head to Green Island for diving, snorkelling and hiking, buy seafood from Fugang Port, relax in Jhihben hot springs and visit Taitung night market to indulge in the local delicacies. Where to stay: Taitung City is full of cosy homestays where you can get some great tips for exploring from your host who will help plan your trips. HANA Homestay offers a delicious breakfast, modern rooms and bicycles for exploring the area. Have a quick weekend jaunt to the colourful and historical capital of Penang - George Town. Awarded UNESCO World Heritage Site staus back in 2008, George Town is bursting with beautiful street art telling the story of its history and people, all amid architectural gems and gastronomic delights selling the likes of Char Kway Teow, Assam Laksa and Nasi Kandar. For those itching to shop a little, Komtar shopping mall has what you need. Where to stay: Have a stay in a heritage building right in the UNESCO district with Cheong Fatt Tze – The Blue Mansion. This courtyard-style mansion features its own bar, concierge service and swimming pool. The elegant city of Bucharest is new to the alternative city break scene and a great option because of its museums, parks, trendy cafés and mix of art nouveau and modern architecture. In the summer make sure you rent a boat in Cişmigiu Gardens and come winter, tuck yourself away in one of the city’s many cosy coffee shops. Where to stay: The city is full of incredible apartments to stay - Diana’s Flat Bucharest has beautiful views of the river and a great location, being walking distance to Old Town, Palace of Parliament and Csmigiu Gardens. The stunning mountain resort of Zakopane has always been popular for ski holidays. With hiking, nature, mountain walks and scenery, Zakopane is your destination of choice if you need a serious mid-year break from all the hustle and bustle of city life. Hike through the Tatra National Park with large patches of pristine green fields and blue, serene mountains acting as your backdrop. The pure fresh air - exactly what you need to rejuvenate and quench your spirits for the rest of the year. Nashville may be famous for its legendary country music scene, but it’s also great for family activities and outdoor pursuits. Music fans, you will want to browse the museums dedicated to Johnny Cash and Willie Nelson, and catch some live music in bars across the city’s vibrant neighbourhoods. For Nature lovers, you will want to explore the city’s many parks, easily accessible by foot or bike. Nashville is on the rise following the success of the drama series named after it. Where to stay: Stay at the SoBro Guest House if you want to check out the music scene by foot - the Country Music Hall of Fame and Museum is only 350 yards away. While Both Bridgestone Arena and Ryman Auditorium are less than 11 minutes' walk away. Beautiful Bogotá, being the hectic heart of Colombia is a great base for exploring the wider country. You will come to appreciate the new restaurant openings and boutique hotels set amongst 300 year old houses, street art murals and museums. Be sure to try some authentic Colombian coffee from one of the many cafes dotted around the city. Known for its museums, culture, food and friendly people, August is also a great month to experience the Carnival of Bogotá (5-6 Aug). Where to stay: The stylish Serie 1948 is a homely Bed & Breakfast located in a quiet neighbourhood near to bars and restaurants. It offers guests bike hire, a sun terrace, garden and locally sourced coffee and food. Adrenaline Junkies, you are in for a treat. There's never a dull moment in Lima – from paragliding to partying, and sunbathing to surfing, where do you start? A popular destination for delicious food, rich history and museums as well as culture and history, Lima is known as the gastronomic capital of Latin America - so make sure you try some local delicacies by taking one of the tasty food tours. The fact that the city’s unofficial slogan is “keep Portland weird” should get you suitably intrigued. Oregon’s largest city offers a buzzing nightlife, fantastic food (you’ll find food trucks on every corner), culture and the great outdoors. Best explored by bike, take a trip to one of the city’s many infamous breweries, and nature lovers will love Forest Park and ‘City of Roses’ at the International Rose Test Garden. Portland's top to-dos are its beer, food, restaurants and shopping. When you think of Australia, it’s usually the popular cities of Sydney and Melbourne that come to mind, but on your next trip down under, why not try the metropolitan city of Brisbane, an up-and-coming destination for 2018. Known for its restaurant and bar scene, vineyards and its beautiful beaches, go surfing at Ocean Beach, soak up the sun at Sylvan Beach, spot dolphins at Red Beach or hang out at the beach style lagoons such as Streets Beach and Settlement Cove. As well as beach life, Brisbane is great for shopping, restaurants, relaxation and entertainment. The charming city of Hannover is on the up for its choice of museums, cultural sites and green spaces such as the Herrenhäuser Gärten, Lake Maschsee and Europe's largest urban forest, the Eilenriede. It’s a great city break for culture vultures, shopping, city trip, old town and city walks. Where to stay: After you’ve had your culture fix for the day, relax in the spa at Kastens Hotel Luisenhof, which also offers fine cuisine, fitness facilities and conveniently located walking distance to the Hanover State Opera House and a short drive from the Sprengel museum.